I took this pic last night when preparing the tea. 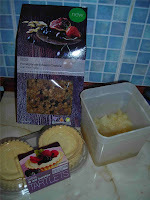 I meant to take a picture of the completed pudding which consisted of the M&S tartlets filled with cold stewed apples, greek yogurt and sprinkled with the M&S posh pomegranate infused granola. I was half way through eating said delight when I remembered I hadn't taken the picture! You will have to believe me when I say, it was very yummy and just soooo quick and easy.